RBTH presents a selection of views from leading Russian media on international events, featuring news of opposition figurehead Alexei Navalny’s preparations for the 2016 Duma elections, as well as reports on online music service Spotify’s decision not to enter the Russian market, and the rising threat of unemployment in Russia. 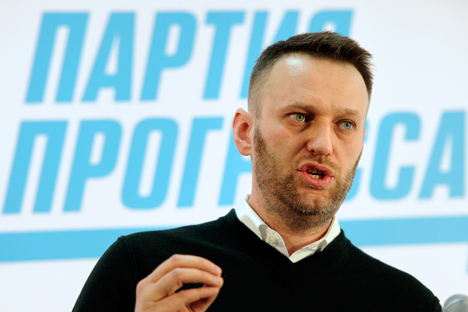 The centrist Nezavisimaya Gazeta newspaper writes that opposition figurehead Alexei Navalny's Progress Party (PP) will prepare for the 2016 State Duma parliamentary elections and regional campaigns, even though the party is not on the register of parties that have a right to participate in the elections. Navalny announced that PP would persevere to achieve this objective through street protests. On Jan. 28 Moscow’s Zamoskvoretsky Court declined the party's lawsuit against the Ministry of Justice, which had refused to include the party in the register of political structures eligible to participate in the elections. Yesterday the PP held a session in the office of the Anti-Corruption Foundation, reports Nezavisimaya Gazeta. Navalny, who had not communicated with party members for a long time, extended his planned 15-minute speech to 40-50 minutes. His message was clear: Without the Progress Party, opposition in Russia does not exist. By considering Ukrainians enemies Russia is dealing "an enormous blow" to its strategic interests. The party must persevere - a key word for Navalny - to participate in the 2016 State Duma elections and the regional election campaigns. The party will persevere in the way Navalny considers the most effective: by taking to the streets. Russians have been left without access to one of the world's most popular musical services, reports the Gazeta.ru online newspaper. The Spotify streaming service will not enter the Russian market, according to one of the service's potential Russian partners. Experts say that the company has been frightened off by the economic crisis in Russia and the unwillingness of Russian users to pay for content. "The service will not enter the Russian market because of the unstable economic situation in the country," says a representative of one of the companies that had planned to work with Spotify. "Moreover, Spotify's management believes that Russia still does not have the necessary potential to successfully operate the business." Dmitry Solodovnikov, Press Secretary of MTC [Russia's largest mobile phone operator with 73.2 million users as of the third quarter of 2014 – RBTH], told RBTH that Spotify's withdrawal from the Russian market could have been the result of failed negotiations with a series of Russian mobile operators. The service's Russian section was registered back in January 2014. In September Spotify postponed its entrance in the Russian market from fall 2014 to the beginning of 2015, basing its decision on the lack of a partnership agreement with Russian mobile operators. The Kommersant business daily writes that Rostrud, the Federal Labor and Employment Agency, has announced that unemployment grew by 7.8 percent in December 2014. Prime Minister Dmitry Medvedev has called for efforts to keep unemployment figures low, but experts believe that old recipes will not help. The people, fortunately, are not panicking, writes the newspaper, but there is certainly reason for concern, with almost every sector at risk. For example, the auto industry is talking about the continuation of layoffs that began in 2014. Some factories, such as General Motors, made staff cuts at the end of last year. Other corporations, such as AvtoVAZ, are only planning to make about 1,000 workers redundant. "The manufacturing and mining industries will continue producing, while unemployment will primarily affect the service industry," says senior collaborator at the Gaidar Institute Yekaterina Pospelova. "In one way or another the salaries of top managers in private companies will be optimized, the advertising market will suffer, as well as the consulting and restaurant businesses." Russians are trying to provide themselves with a safety net. Many have already learned from past crises and are preparing themselves for new ones beforehand. "People are updating their CVs and are starting to look for backup opportunities," says Natalya Danina, director of the project ‘Databank of Headhunter Salaries’. "This is a justified strategy. In comparison with the previous crisis, people are now more familiar with their rights and can protect them from employers. The latter have also learned a lot, which is why there will now be a significantly smaller number of shady layoff schemes."